Mr. Spock and the Beginning of Seeing Myself | Persis Karim, Ph.D.Persis Karim, Ph.D. Thank you Leonard Nimoy. Son of Ukrainian Orthodox Jews who taught me how to navigate some of my complex identity. Thank you Mr. Spock. Thank you Leonard Nimoy. You are one and the same to me, really. I will miss your voice and serious demeanor, your depth of vision as a man and an actor, but more so, as someone who straddled the centuries, and helped me straddle my own sense of time and place. I guess I feel sentimental about the Star Trek series because for people of my generation (born in the early sixties and raised in the seventies), that show took risks and embodied the change that loomed on the horizon of American culture and society. Seeing a black woman communications officer, Lieutenant Uhura, seeing the Japanese Sulu, even hearing the voice of a female computer, helped me see that my life would be different than my parents, but especially my mother’s. More than all the risky roles Gene Roddenberry helped to realize in the original series, it was Mr. Spock with whom I felt the deepest connection and the most identification. Yes, he was a man, and of course, I was drawn to his mysteriousness, his intellectual prowess, his good looks, and his eagerness not to cave in to human emotion (although I still hold my emotions dear, and I might even be accused of being possessing “female irrationality”), and yes, I always had a crush on him when other girls and women went for Kirk. Never, ever did I feel anything for Kirk. Beyond being a womanizer and desperate for female attention, he struck me as arrogant and cocky. Spock on the other hand, evoked a kind of quiet dignity, a desire to be in the world, but also a recognition that he did not fully belong. I identified with him, even as a young girl. It was only much later in my life, when I actively sought to understand my immigrant parents, my immigrant father, born in France, raised in Iran, and immigrated to the US, that I began to see something of Spock in my dad too. He had that same commanding intellect, that same desire for logic, but also the same love of questions. But Spock did remind me of myself. I really tried to grasp what a half-Vulcan, half-human person might be struggling with; his cultural angst, his sense of loyalty, his anxiety about belonging to both and neither culture and having to prove himself to the Federation. I could not help seeing traces of my own life in his. I too was the product of two cultures, two parents who migrated from elsewhere who were raising their children in a third culture. Back then, there as NO vocabulary or appreciation for bicultural and biracial identity. These terms did not yet exist in my childhood. We were still consider mongrels, freaks, and half-breeds (in the negative sense) and identifying with either nationality seemed a perilous kind of social ostracization to bring on oneself. Seeing Mr. Spock on the black and white screen of our TV as a girl of 9 or 10, (who knows if it was reruns or the real thing or both? ), I began to entertain the possibility that what I was, like Spock, was unique and different, and maybe might one day even be a badge of honor. I saw the power in a character like Spock. I saw his adaptability, his insight, his “do-rageh” (in Persian this means, “two-veined” –as in two bloods run through me), perspective as something that made him smart and sophisticated, and maybe even a little cutting-edge. I also saw in him the vulnerability of someone who was straddling two cultures (his earthling mother’s and his Vulcan father’s in a third world aboard the Starship Enterprise). He made the best of his alienation and his discomfort, and he found both appreciation and humor for the perspective he wielded. Yes, Mr. Spock helped me understand myself a little better and made me feel that living on the edge of cultures, living with the sense of ill-ease, of not belonging had its own vision and benefits. I often felt that while the series made him more Vulcan, inside he was much more about the process of embracing all his influences–human, Vulcan, Federation, exilic, traveler, scientist, questioner, and about negotiating and maybe even fooling people into assuming he was much more simple than he really was. 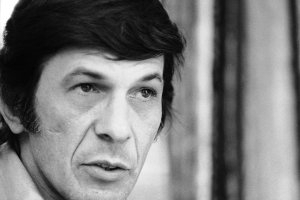 I saw in Spock, and in Nimoy’s portrayal of him, someone who understood and felt compassion for the complexity of navigating more than one culture and being able to offer a kind of leadership and intellect that we still so desperately need today. Thanks to Leonard Nimoy, and to his wonderful rich, complex Spock character, I later found some of the words to launch me on my own journey to embrace my heritage as an Iranian-French-American child. Though it was just a seed, it was a seed of representation that I will never forget. It helped me see myself somewhere in the popular culture of the United States, as someone who did not wholly have to fit in, but yet had something to offer to others. It began on the TV screen, and I hope it will live on in my son who also embodies several cultures. Thank you Leonard Nimoy for bringing your own immigrant sensibilities to this role and for making me feel a little more half-human than not. And for offering me one of the first representations of my bicultural identity. You were a good egg and a wonderful Spock, Mr. Nimoy. Live Long and Prosper.